ID:SR, Sheppard Robson’s interior design department, has completed the office design and fit-out for law firm Halliwells in Manchester’s Spinningfields district; the city’s latest expression of architectural and cultural excellence. 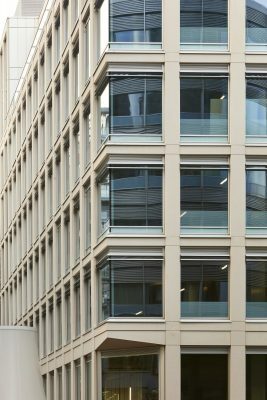 Halliwells, the fastest growing law firm in the UK, moved from several offices to a flagship headquarters at 3 Hardman square. ID:SR advised Halliwells on choosing the most suitable building and ensured the project reflected the right brand vision, image, office culture and future working practices of the law firm. ID:SR established a design brief to create an open, efficient, sleek and unrestricted workspace; communication barriers caused by cellular office units were removed by situating lawyers behind transparent full height glazing linked directly to legal support staff. Where partitioning was unavoidable, meeting rooms were housed behind glowing opaque glazed boxes to enliven the interior space. The most outstanding element of the building’s design is the top floor, offering panoramic views across Manchester’s evolving cityscape. Clients are taken directly to this level from reception and the floor includes seminar space, a restaurant, boardroom and entertainment space for 200 people. Spinningfields was a brownfield site due for redevelopment when Halliwells agreed to occupy 3 Hardman Square in 2004. 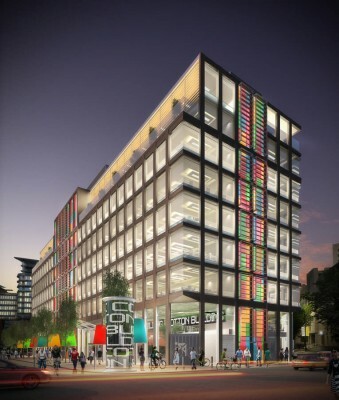 This decision paid dividends for the law firm – Allied London Properties has since transformed the area to become the latest hub of commercial and social activity in Manchester. The largest law firm in the North now has an office specification to rival any of London’s legal elite. ID:SR, led by Helen Berresford, is the interior design group within Sheppard Robson providing the full complement of services from due diligence and building acquisition through brief taking fit out and post occupancy studies. Sheppard Robson is an international practice providing architectural, urban design, town planning, masterplanning and interior design services. With more than 65 years experience, it is one of the largest practices in the UK with over 300 people in established offices in both London and Manchester and Glasgow. The practice enjoys a reputation for excellence in design and professional service, with extensive expertise in every development area.